Suez | Egypt’s Antiquities Ministry announced this morning that a team of underwater archaeologists had discovered that remains of a large Egyptian army from the 14th century BC, at the bottom of the Gulf of Suez, 1.5 kilometers offshore from the modern city of Ras Gharib. 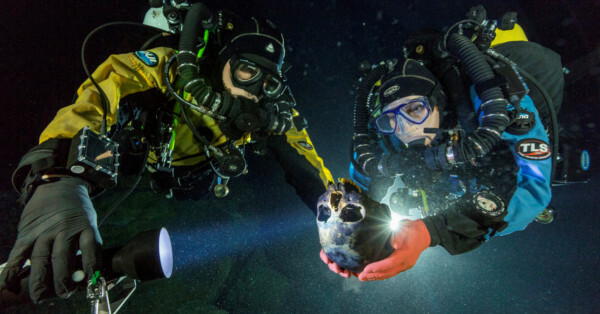 The team was searching for the remains of ancient ships and artifacts related to Stone Age and Bronze Age trade in the Red Sea area when they stumbled upon a gigantic mass of human bones darkened by age. The scientists led by Professor Abdel Muhammad Gader and associated with Cairo University’s Faculty of Archaeology, have already recovered a total of more than 400 different skeletons, as well as hundreds of weapons and pieces of armor. The remains of two war chariots were also discovered scattered over an area of approximately 200 square meters. They estimate that more than 5,000 other bodies could be dispersed over a wider area, suggesting that an army of large size may have perished on the site. Many clues on the site have brought Professor Gader and his team to conclude that the bodies could be linked to the famous episode of the Exodus. First of all, the ancient soldiers seem to have died on dry ground, since no traces of boats or ships have been found in the area. The positions of the bodies and the fact that they were stuck in a vast quantity of clay and rock imply that they could have died in a mudslide or a tidal wave. The sheer number of bodies suggests that a large ancient army perished on the site, and the dramatic way by which they were killed, seem to corroborate the biblical version of the Red Sea Crossing when the army of the Egyptian Pharaoh was destroyed by the returning waters that Moses had parted. This new find certainly proves that there was indeed an Egyptian army of large size that was destroyed by the waters of the Red Sea during the reign of King Akhenaten. “This astounding discovery brings undeniable scientific proof that one the most famous episodes of the Old Testament was indeed based on a historical event,” Professor Gader said during the press conference. “It brings a brand new perspective on a story that many historians have been considering for years as a work of fiction and suggesting that other biblical stories like the Plagues of Egypt could indeed have a historical base. A lot more research and many more recovery operations are to be expected on the site over the next few years, as Professor Gader and his team have already announced their desire to retrieve the rest of the bodies and artefacts from was has turned out to be one of the richest archaeological underwater sites ever discovered. 1 Comment on "Red Sea: Archaeologists Discover Remains of Egyptian Army From the Biblical Exodus"